This piece was written in November 2012. You know how it is. Every Christmas, the same old decision: do you go for one with a chunky wooden base that can just be stood in a corner of the sitting room, or do you go for one without a chunky wooden base that needs to be wedged in a wastepaper bin filled with earth dug up from the garden or a local park? Or do you – just for once, just for a change – think, what the hell, and go for one that needs to be supported by an obscuring framework of waist-high steel crash barriers? It’s like a metal polo-neck jumper on a triangular-headed green robot spy in some Sixties TV sci-fi oh, this is not a good simile. But you know what I mean. Poking up over the top of the barriers like that, it just looks a bit neckless, and sad. It wasn’t helped by the fact that there was no sky today. I hate it when the sky disappears. Obviously some years you end up with a shorter one than you intended, just because the big ones are sold out (2009), or too expensive (2008), or you can’t get them on the bus back from Clapham (2007), but – surely, when that happens, you just stand what you’ve got on an improvised coffee table plinth or upturned bucket covered in crepe paper, don’t you? Just to leave room for the presents, if nothing else. 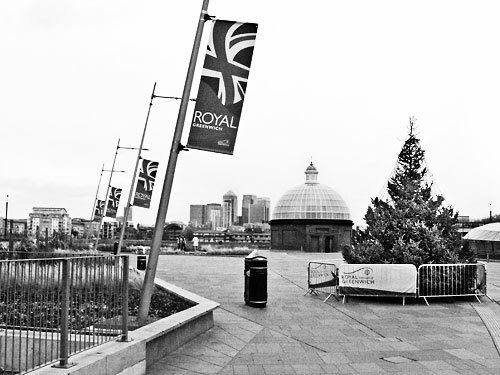 Do Greenwich Council really not have any spare plinths? Also, those lights; everyone knows that Christmas tree lights wind round and round like a helter-skelter, they don’t just drop straight down from the top like maypole ribbons. Where’s the artistry in that? Oh well. It’s done now, and that must mean Christmas is definitely on the way. 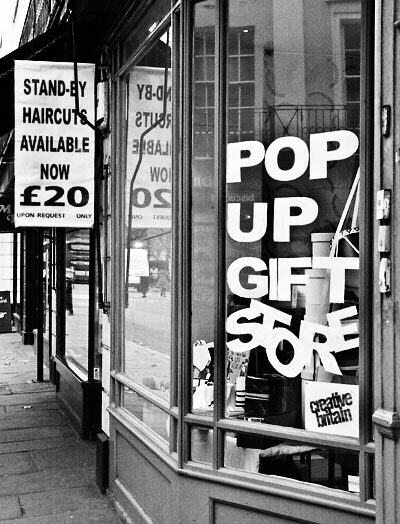 I see there’s already a “pop up gift store” next to the Greenwich Clipper, selling things that are, by definition, useless, otherwise shops would exist to sell them in the other eleven months of the year. While I was staring in through the window, trying to see what was on offer – origami toast racks, hats made of cheese, prettily decorated boxes to keep other boxes in – I spotted, for the first time, the small print at the bottom of the Clipper’s STAND-BY HAIRCUTS AVAILABLE NOW £20 sign; it pointed out that such haircuts are performed UPON REQUEST ONLY. Damn it. For weeks now I’ve been crossing over at the lights, just in case someone leapt out of the Greenwich Clipper with a pair of scissors and tried to give me an unsolicited Justin Bieber.